Not Traditional, but So What! If you have ever made tiramisu before than you know it is a little time consuming. It involves making a zabalione which requires a bit of time beating the eggs over low heat in order to ensure that they are safe to eat (no salmonella!). The traditional way to prepare it also requires fresh whipped cream made from scratch- which takes time and not to mention adds more calories. So when I came across this quick, easy and light recipe from Supreme Dairy Farms (located right here in RI! ), I knew I had to try it. The Supreme recipe uses ricotta cheese in place of the mascarpone and no eggs which is not traditional at all for a tiramisu. I would have tried the recipe just as written, but I happened to get a great deal on mascarpone cheese at Whole Foods and it was sitting in the fridge just waiting for a reason to be used! So I obliged. Preheat oven to 375°, arrange ladyfingers on baking sheet. Bake until toasted, about 5 mins. Mix the teaspoon of sugar with the espresso and dip ladyfingers in it quickly turning to coat each side. Arrange half of the ladyfingers in a 2 or 2 1⁄2 quart oval or rectangular serving dish. In a small bowl, mix mascarpone, ricotta, yogurt, sugar and liquor; beat thoroughly until smooth. Spread half of the mixture on the ladyfingers in the serving dish. Sprinkle with half of the chocolate. Repeat layers of ladyfingers, dipped in espresso, mascarpone mixture and chocolate. Cover with foil and refrigerate at least 1 hour. Dust with cocoa powder or fresh grated orange rind before serving. Yes, so waht! It nonetheless looks and sounds mighty good! 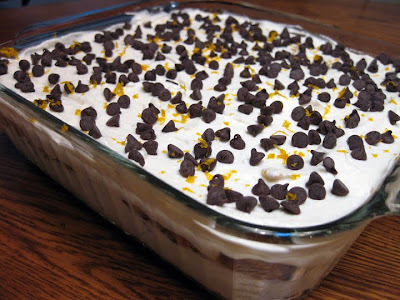 This is a great alternative to traditional tiramisu. Love it! Thanks for sharing. Love that you can make it ahead and freeze it - looks delicious! This looks absolutely out of this world delicious. I would like to make it and enjoy it too.